Almost two years ago I wrote a blog about the growing online coupon business. At that time the frenzy was in full swing: Groupon was the media darling, copycats were everywhere, and the future was so bright, they had to wear shades (half-off of course). There were, however, naysayers calling out problems with the daily deal model: they were putting small businesses in the red, they only made money for greedy Groupon-types, daily deals were just a phase. They were right. But not completely. Fast-forward to September 2012: Consumers still love saving money (DUH) and deals are here to stay, but in different incarnations. Groupon has become to online deals what Kleenex is to tissues, but there are major shifts in the landscape. 1) Groupon went from a rock star to has-been: As the deals market became more crowded with me-toos, combined with the “thrill is gone” from consumers. 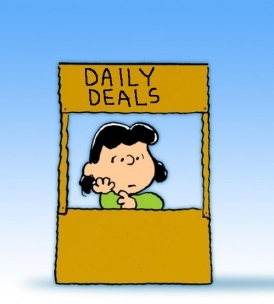 the daily deal concept itself became stale. Groupon tanked after its initial IPO at $20 a share in November 2011 (at last check, its price was a paltry $4 a share) which coincided with the domino effect of lackluster social media company IPOs. LivingSocial, Groupon’s biggest competitor with a sizable ownership by Amazon, has also been steadily eating into its market share. The most recent blow was Starbucks choosing LivingSocial for its daily deal, which sold out immediately and was the biggest revenue generator yet for the company. Yelp and OpenTable still offer deals but scaled back on promotion and rely on their core businesses. 2) Alternative deal sites, niche markets and buy outs, oh my: As the daily deals market became saturated, Groupon and other companies started hawking national and local offers with a longer shelf life. New business models and after-markets also popped up; sites curating a city’s “best of” deals such as Dealery and Yipit, or expiring, unwanted deal sites such as Couprecoup and FatWallet. There were also many companies renamed, bought, funded and vertical niche start ups in clothing, food, and other services, as seen in this 2011 Deals Infographic. Marqeta, a different concept altogether, uses a discount card that rewards loyalty to its vendors. 3) Mobile apps rule: No surprise, smartphone apps is the fastest growing area in the deals segment. Location-based apps such as Mobsav, Yowza and others offer national and local deals but most consumers are still uneasy with companies tracking their whereabouts. Companies already on mobile-friendly turf, like Foursquare and Facebook Check-in Deals (formerly Facebook Deals), have a built-in advantage. Some location-based apps combine offline shopping habits with mobile apps to discover discounts when a consumer is approaching that desired item. These apps all operate differently but the premise is the same: Vendors like Swarm and Spotzot knows who you are, what you want to buy, and will “activate” when you are near the location of your holy grail. Not ok with Deal Big Brother watching? Scoutmob offers free half-off deals (yes, FREE! ), a cheeky brand personality, and entertaining, useful e-newsletter. Scoutmob only charges the vendor on redemption, so it’s a win-win for the deal-bearer and the consumer. Credit card companies like American Express are also getting in on the action and benefit from having a solid social media presence. Groupon and LivingSocial have added mobile apps to their menu but operate the same way as the website. Deals will continue to transform with new technology and consumers’ behavior and preferences. The market will also continue to shake out: Some deal apps and sites will thrive while others will go to the coupon cemetery. A glaring weakness and missed opportunity for all of these companies offering deals (other than location-based apps) is good target demographics —sounds counterintuitive but true. Knowing subscribers well would arm companies with a goldmine of data to offer relevant deals. In a recent experiment I did, Groupon is the only company that asked for even the most basic information. Either these companies are not marketing-savvy enough, worry that consumers will bail if there is an avalanche of questions, or are too busy focusing on the bottom-line to pay attention to their customer. All. Bad. Ideas. Having subscriber access to email is a privilege and a gift. If the balance of interest tilts, these companies could lose their coveted spot in subscribers’ in boxes. And like all good marketing campaigns, closing the loop on deal usage is the next frontier. Deals present tricky ROI math: companies may know how many deals were sold but not how many were actually used, or redeemed by a mobile app but not tracked, or sold on a website. Or any other number of scenarios. A recent deal by Coca-Cola and Auntie Anne’s hopes to trailblaze this path but it will take long-term data to show true bottom-line value to both the company offering the deal and the vendor distributing it. The ROI results could provide compelling data that could easily shape future deals for customers. In the meantime, I’m still waiting for a deal to upgrade my site on WordPress. I need a Groupon intervention as they now offer “goods” not just deals – but I tend to delete those emails now to avoid temptation. From Living Socials to Groupons to Gold Star and beyond. Well done! You are such a smart cookie!